Quick! What’s the first thing you do after a bike ride? If you didn’t answer, “take off your chamois,” then we’ll give you a moment to rethink your response. Most of us call them bike shorts. But years ago, I overheard a professional cyclist refer to them as “chamois,” and I immediately adopted the affectation as my own. It made me feel a little cooler and a little faster than I am. Try it, and you’ll see. Regardless of what you call them, bike shorts are integral to riding. (If you don’t think so, you’ve probably never worn them.) Plus, they can be expensive, which is extra incentive to ensure they last. Below are a few “Dos and Don’ts” for keeping your chamois in tip-top shape. DO wear shorts with a comfortably snug fit. The material shouldn’t jiggle around, but neither should it cut off circulation. DON’T wear underpants with your bike shorts. Trust me on this one. DO care for your shorts as the high performance gear they are. The fact that you can throw them in the wash without regard doesn’t mean that you should. DON’T ever use fabric softener. Fabric softeners coat garments in a subtle, stain-blocking film, which is the very reason clothes and towels treated with softeners feel so soft to the touch. The problem is that this film clogs up the wicking and breathability features of synthetic and wool fibers. DO wash in cold water. Heat is the enemy of Lycra and elastic. DON’T use a heated setting on the dryer, or don’t use the dryer at all. Most people agree it’s best to line dry cycling gear. If you’d like to accelerate the process, use the dryer on no or low heat. DON’T assume your “chamois”—and by that I actually mean the part that cushions your bum—is made of suede leather. While this all-important section of the bike short used to be made of sheep hide, most “chamois” from the past 15+ years is fully synthetic and should be cared for accordingly. DON’T assume you need the thickest chamois on the market. 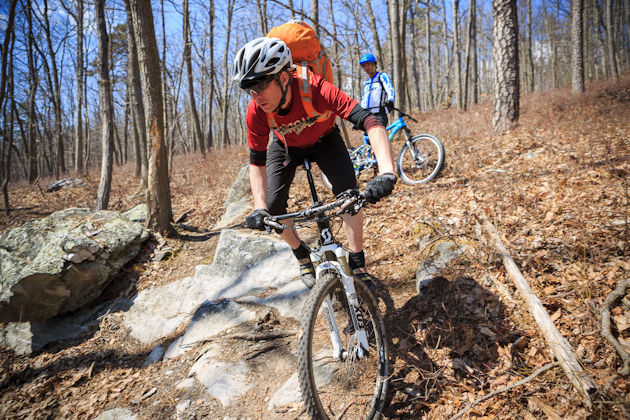 Ask an expert at the bike shop to recommend the right shorts for your type of riding. A general rule of thumb is this: If you prefer an upright position, buy shorts with extra rear cushioning. If you’re more stretched out on the bike, opt for shorts where the chamois foam is more evenly distributed. Categories: Gear Care | Tags: bike chamois, bike shorts, bike shorts care, Chamois, Cycling, Cycling shorts | Permalink. 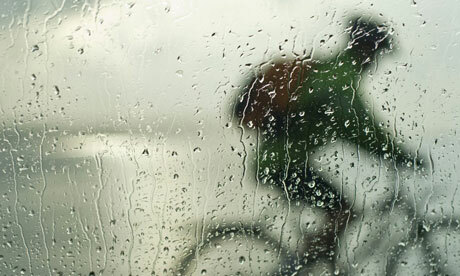 Rain doesn’t ruin a great bike ride. To the contrary, there’s something empowering about getting off the couch in the gnarliest of conditions. A bike ride is particularly sweet when others scapegoat the weather and leave their bike hanging in the garage. No, the rain isn’t the problem. Getting wet is. 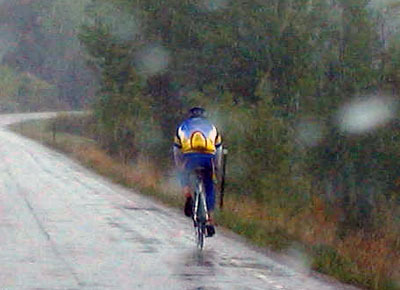 Luckily, the nature of being on a bike means your upper body will take the brunt of rain. This is a place where Nikwax can help. A base layer that keeps your skin dry. Make that a breathable base layer. Even though it’s raining from the outside, you’ll still be sweating from the inside. Washing base layers with Nikwax BaseWash® prevents build-up of odor-causing bacteria and oils on synthetic garments. It also enhances wicking properties to move the sweat away from your skin. The special formula cleans and conditions, keeping the synthetic fibers in tip-top performance shape. Or, if you’re a wool base layer fan opt for Nikwax Wool Wash. Though durable, wool requires a gentle cleaner like Wool Wash to maintain its balance of hydrophilic inner and hydrophobic outer. Without getting too technical, that is the magic of why you stay warm even when your wool gets wet. A waterproof-breathable outer layer that wicks sweat away from your body without letting the rain in. On a bike, your jacket gets hammered with rain on wet days and sun and dirt on dry days. This extreme exposure to the elements contributes to a condition known as “wetting out.” The dreaded “wet out” is when your jacket can no longer bead up with water droplets. The result: it ceases to be waterproof and/or breathable. The solution is frequent application of Nikwax TX.Direct®. First, run the jacket through the wash with Nikwax Tech Wash® to clean away any sweat, oil and other dirt. With another run of the washing machine, or with the Spray-On bottle, apply TX.Direct® to revive and enhance your jacket’s water repellency. 2. Remember your extremities: Head, hands and feet. Keeping your core warm and dry may be the most critical, but thoughtful care to your alternative gear will help keep you comfy. Consider a Merino wool skull cap under your helmet. It won’t keep you dry, but it will keep you warm. Have a pair of full-fingered gloves on hand for inclement days. While some are blended with mesh for breathability, most cycling shoes are leather. We can’t do anything about the mesh, but Nikwax Waterproofing Wax for Leather™ will keep your feet dry from the water falling from the sky. And no, it won’t make your shoes any heavier or hotter for the dry days. Don’t let a little rain put a kink in your riding schedule. With a modicum of preventative Nikwax care, the only thing standing between you and your personal best is your own motivation. Categories: Uncategorized | Tags: Cycling, cycling in the rain, Cycling shoe | Permalink. Cyclists, are you making good eye contact? A friendly gaze isn’t just for flirting—it’s perhaps one of the most important things bicyclists can do to bike safely through traffic. Although it doesn’t appear on standard lists of cycling safety tips, making eye contact with drivers at intersections—the most dangerous spots on the road—is crucial. Paired with hand signals, a little eyeball time helps communicate your intentions. Plus, you get the reassurance that the driver has registered your two-wheeled presence. 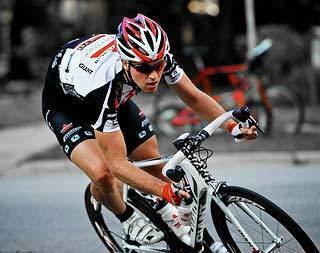 May is national bike month, and we at Nikwax are avid cyclists. We want to share our love of two wheels. Always wear a helmet. Mary Craig, a coach at Seattle’s Cycle University, follows this ironclad rule: Don’t even sit on your bike without wearing a helmet. Be visible. Even during daylight hours, wear a bright top—the flashier, the better. Cycling after dark? 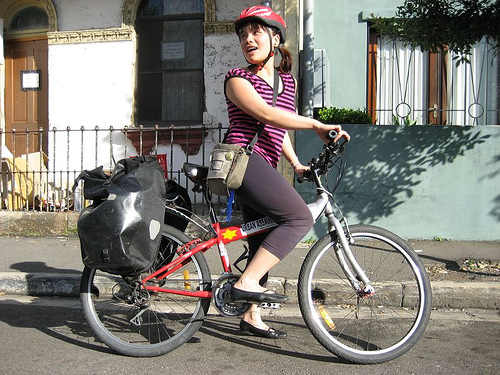 Don reflective clothing and add lights to both the front and rear of your bike. For the handlebars, choose a light that emits a steady white beam. For the rear light, use a red blinking model to catch drivers’ attention. We love the Planet Bike Superflash: mount it to the bike or clip it on a jacket. Be predictable. Though it’s tempting to weave through gridlock like a Jet Ski buzzing a flotilla of barges—don’t do it. In the eyes of the law, bikes are vehicles, subject to the same rules and responsibilities as cars. Ride where drivers expect you to be (not on the sidewalk), and use hand signals as if your life depended on them. Because it just might. Be respectful. Move over at intersections for right-turning cars, don’t needlessly block lanes, and ride (single-file, please) to the right. But how far to the right is far enough? Proven tip: When the city pavement shows grooves worn by car tires, ride in the right one. You’re less likely to get “doored” by parked cars, and drivers will instinctively move out and around you. Get out there. The more bikes on the road, the safer the streets. Case in point: Downtown Minneapolis saw a 174% increase in bicyclists between 2003 and 2008, but a 20% drop in car-bike crashes for 9 years starting in 2000. There’s safety in numbers. So grab that helmet, level your gaze, and we’ll see you on the road! 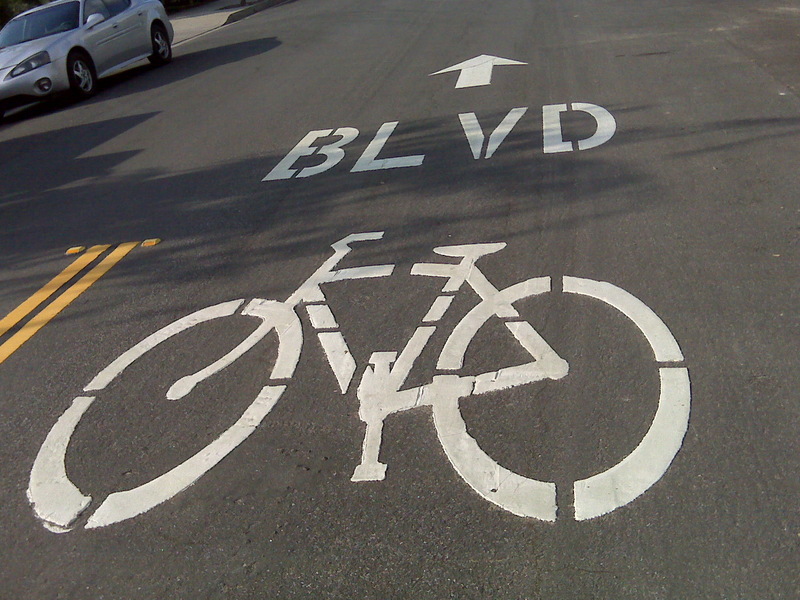 Categories: Events, Stories | Tags: bicycle, national bike month, safety tips | Permalink.